It's not fair but choices you make when your 14 affect you when you're 40. I say it's not fair because what in the world do you know about life when you're14? Certainly not enough to make good choices. Your brain isn't even fully developed and connected when you're fourteen. Doctors say that happens around 20. I remember counseling one young man who was in his senior year in college. He was having a bit of a pity-party about how difficult life is and how unprepared he was to make the decisions ahead of him. Career, marriage and everything else that was coming his way left him feeling overwhelmed and I couldn't blame him. Not really. He had a lot of book knowledge and not a lot of practical skills. As we discussed his options I told him that two hundred years ago he would have started college at the age of 14 and could read and write in at least three different languages. It would be a privilege to go to college because it would mean not having to apprentice at a job requiring hard labor. Not only that but if I threw him out in the acreage behind the college he would have been able to build a shelter and forage for food without using his father's credit card or going to Burger King. I asked him what he thought the difference was between the 14 year old 200 years ago and the 22 year old man he was. He thought for a long time and then said softly, "I have never worried about my survival.... I have been given everything." That was an "Oh face" moment. You know the look of knowledge that comes over someone as they say "Ohhhh" and they see something clearly for the first time. As a counselor, I live for 'Oh face' moments. I had my own 'Oh face' moment today. I hobbled out to get my mail and I saw an envelope with a return address I didn't recognize. The envelope had a computer generated address label on it and it looked like some cheesy graphics on computer paper. I immediately thought I was being solicited for donations and wondered who wanted me to give them some money. Boy was I surprised to find that an older couple from my church had sat at their computer and made me a get well card. Suddenly I was touched at the time and effort that they would put into personalizing a card for me. I was also ashamed of myself. So ashamed that I didn't want to go to church and see this lovely couple for fear there would be a neon light shining above my head flashing "She is so cynical and jaded she thought you wanted money from her." It has become very clear to me that God has placed me in this family of believers to teach me how to be loved. I am not very good at it. The choice that I made as a child to keep everyone at arms distance isn't serving me well at 50. It makes me wonder what other habits I have that aren't serving me well. 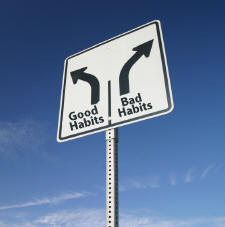 God made us creatures of habit and when our habits are good it works for us. When they are bad, it works against us. I wonder what else is lurking under the surface that I need to deal with? I will leave it to Him to show me.